In order to issue a Registrar’s Certificate the Registrar needs the Death Certificate or tell the registrar that the coroner has told you that you can register. 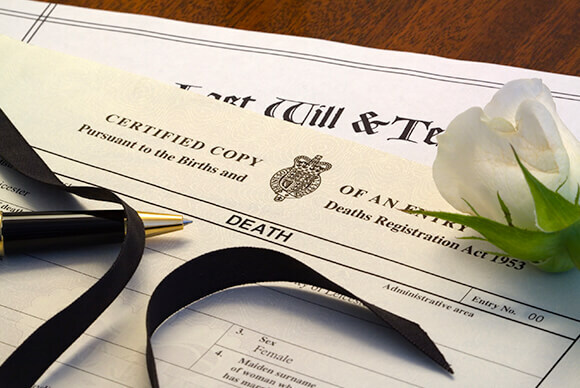 You will usually be given a copy of the Death certificate, a certificate of registration/notification (BD8) and a Certificate for burial or cremation. The copy of the death certificate is what people mean when they ask to see an “original” of the Death Certificate. The registrar will issue one and you are able to purchase more, we suggest to purchase as many as you may need as the price to get a copy after your appointment can rise significantly. If there has been an inquest with the coroner then you will be issued with an Interim Certificate which you can use instead of certified copies. The Certificate of Registration/Notification (BD8) is free and you need to complete the form on the back to notify the Department for Work and Pensions of the death if the person received a state pension or any other benefits. This form can be obtained from the Registrar even if the death cannot be registered yet. Some registrars do this with you and send it off. The Certificate for Burial or Cremation is free and commonly referred to as the green form. It proves to the funeral director and cemetery or crematorium authorities that a funeral may take place, this needs to be given to our funeral director as soon as possible to allow the funeral to take place and for you to see your loved one if you have chosen to see them again. If the coroner is involved then this form will be replaced by a document from the coroner's office.